I've been noticing that other people have been posting photos the old times in their hometowns, so I figured I'd do the same with my favorite photo from Old San Luis Obispo (SLO). 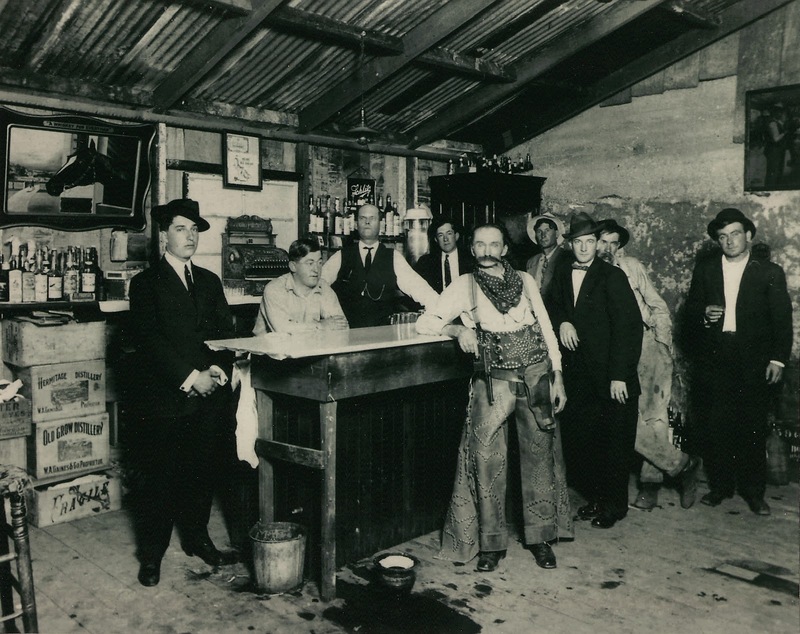 This is a photo of the H & H Bar at 862 Monterey Street in San Luis Obispo taken in the early 1900s. I love the photo for the man in the middle, John Baptista Romo, one of Old SLO Town's more colorful characters. He was a cowboy on the Hearst Ranch, but liked to dress this way, even when not working. The pistol he sports was used for shooting squirrels on the ranch. When he was older, he took to wearing medals and decorative items on his chest just for the attention. Seems like when I was a kid, there were still a few of these colorful holdouts to be found, but not very many any more. Where did they all go? The H & H vanished when Prohibition came along, and Romo died in 1963. Any of you have any memories of Old Coots from your childhood? Looks like they missed the spittoon more than hitting it. His pistol is an automatic pistol instead of a revolver. The one box on the Left side looks like it says OLD GROW DISTILLERY. I have heard of OLD CROW, but never OLD GROW. I GOGGLED OLD GROW and found this OLD GROW DISTILLERY,. IN. COUNTY, KY. But could not find much else about it. Love Romo's outfit. You wonder how many squirrels he had to skin to afford it. With the bucket & whatever is spilled by the spittoon, this place could have been called the 'Bucket of Blood' Saloon. German Mauser model of 1896 "Broomhandle" At the time that was cutting edge firearms technology. Look Out squirrels! I googled 'hermitage distillery'. There was a Hermitage Distillery at Frankfort, Kentucky. It was owned by W.A. Gaines & Co. Distilleries. Some people focus on the pistol, I want to mention the nice cash register (presumably a NCR model).